ONE: You need to pay your membership fee. FEE IS $270 for MEN and $100 for LADIES payable by 1st APRIL. See below for details and payment method. 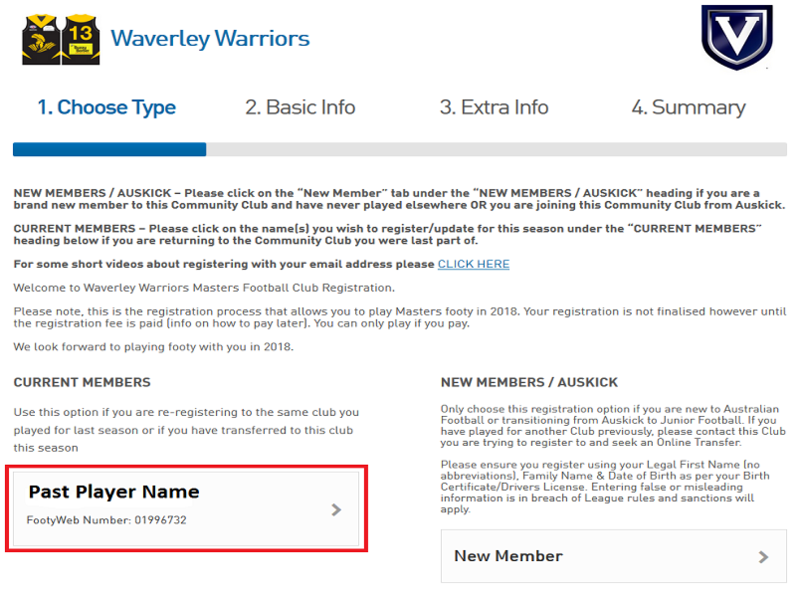 THREE: If you are new to Waverley Warriors AND have never registered on Sporting Pulse as a player at another footy club then you need to register online. See below. The membership fee for 2018 is $270 for MEN and $100 for LADIES. There are no volunteer levies this year. Payment MUST be made by the 1st of April at the very latest. If you do not pay you CANNOT play. Anyone with genuine hardship please see Bomber in confidence. 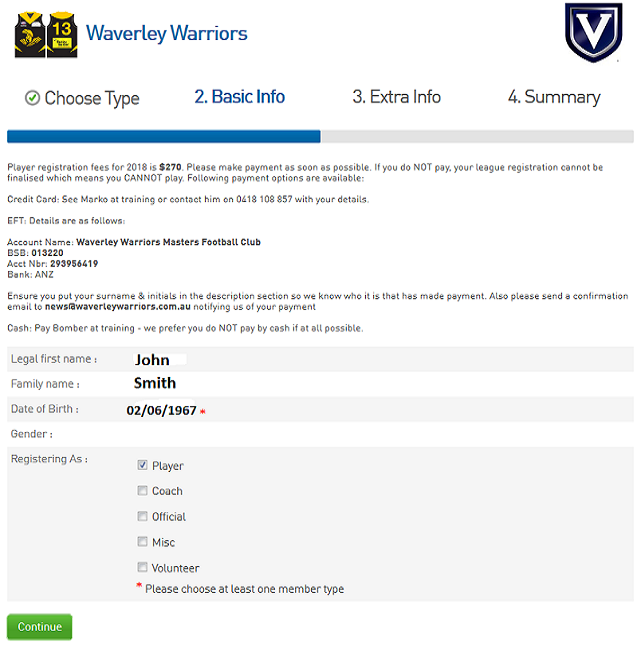 If paying by EFT please ensure you put your surname and initials in the description section and send a confirmation email to news@waverleywarriors.com.au notifying us of your payment. Cash is a last resort. Methods A and B are preferable. Give cash to Bomber and ask for a receipt. If the system does NOT recognise your email address, please contact Bomber to help resolve as it is possible it has you registered with an old email address. Next click on the area at the bottom left where it shows your name. Ensure all your details are correct and, if not, modify them. All fields with a red asterisk are mandatory. Then understand the terms and conditions and ensure the Terms & Conditions box is ticked. 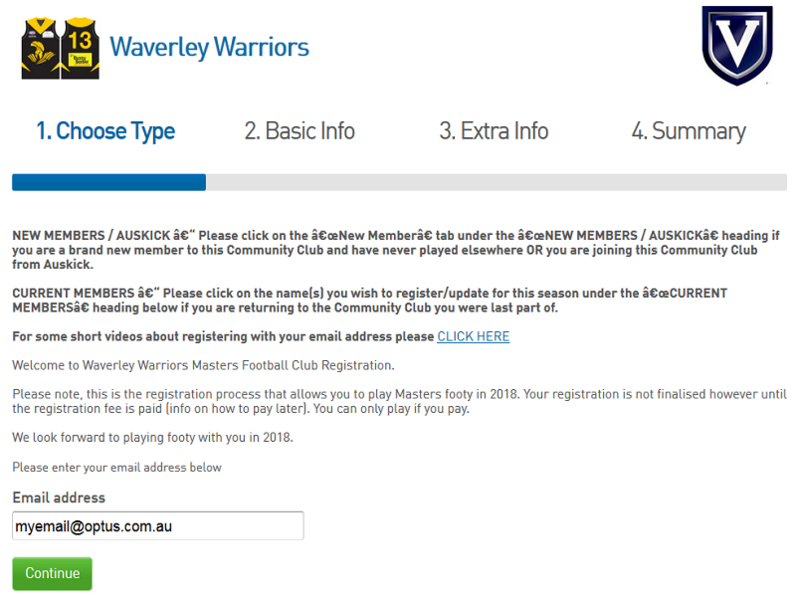 Press Confirm button to finalise your registration. If successful a screen will indicate you are now registered. Firstly, enter your email address and press Continue. The system will not recognise your email address so click that on the ‘Yes, I’m new’ button. Your account will be created and you will need to find and email it has sent to your email address. Follow its instructions to enter a password. You must do this within 48 hours. Once done please continue to follow the instructions in TWO. If you have played footy before for another club in the last few years this will require a request for transfer. Please see Bomber to begin the process. He will need your full name and date of birth and club you previously played for. 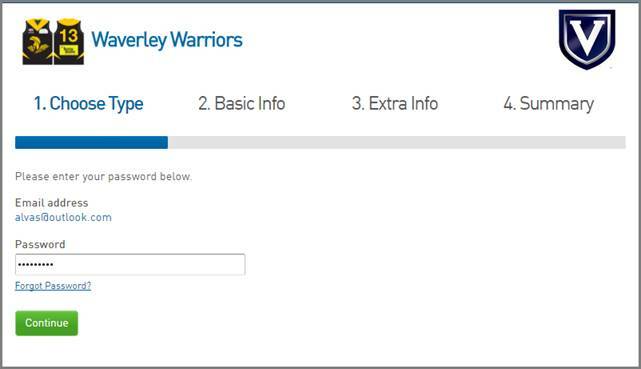 Transfers can take a few days so ensure there is plenty of time to complete the process otherwise there is a risk you can’t play Round 1. To avoid disappointment, the sooner you organise this the better.